The Carolina League crowned its champion Tuesday when Buies Creek defeated Potomac, 2-1, in a winner-take-all, one-game Mills Cup Final. Two days later, it's handed out more awards. No. 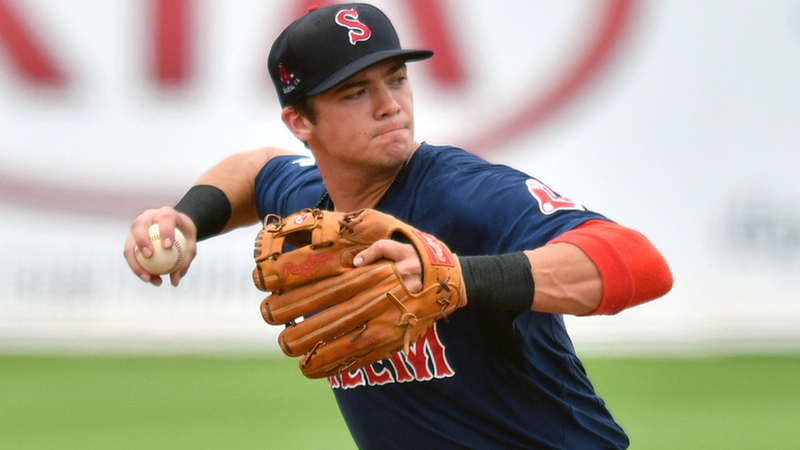 6 Red Sox prospect Bobby Dalbec is Carolina League MVP, No. 5 Nationals prospect Wil Crowe takes home Pitcher of the Year honors and four members of the Winston-Salem Dash, including first-time manager Omar Vizquel, highlight the Class A Advanced circuit's end-of-season list, the league announced Thursday. Dalbec was the Carolina League's premier slugger in 2018 and led it in several power-hitting categories, even after being promoted from Salem to Double-A Portland on Aug. 3. The 23-year-old third baseman finished the season as the league leader with 26 home runs, 55 extra-base hits, 85 RBIs, a .573 slugging percentage and a .945 OPS. He also ranked third with a .372 on-base percentage and fourth with 197 total bases through his 100 games with Salem. Including his time with Portland, Dalbec finished with 32 home runs overall, tying him for fourth in the Minors. Crowe, a second-round pick by the Nationals last year out of the University of South Carolina, went 11-0 with a 2.69 ERA, 1.16 WHIP, 78 strikeouts and 30 walks in 87 innings during his time with Potomac. He was one of only two Carolina League pitchers to win 10 games, despite making only 16 appearances with the P-Nats. His 2.69 ERA ranked seventh among the 39 CL pitchers with at least 80 innings while his 1.16 WHIP was eighth. Winston-Salem led the way with four honorees, highlighted by Vizquel's Manager of the Year award in his first season in the Dash dugout. Winston-Salem led the Carolina League with an 84-54 record and won both halves in the Southern Division. Outfielder Blake Rutherford, who at No. 86 was the only top-100 prospect on the All-Star list, led the player contingent after hitting .293/.345/.436 with seven homers and 15 steals in 115 games. Catcher Yermin Mercedes (.289/.362/.478, 14 homers) and designated hitter Micker Adolfo (.282/.369/.464, 11 homers) rounded out the Dash contingent.